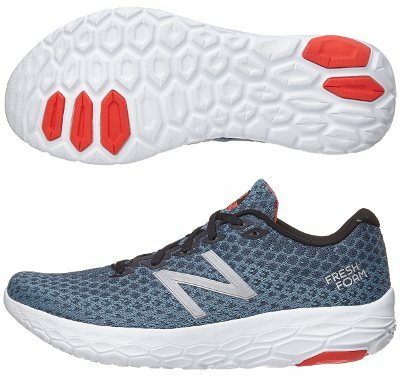 New Balance Fresh Foam Beacon are neutral cushioned running shoes. The new and tasty New Balance Fresh Foam Beacon has been released under too many questions and several biases. It is clear that Boracay saga did not match expectations from american brand but they insist on filling the gap within lineup and offer an (apparently) simple running shoe, plenty of cushioning and low drop... kind of Saucony Kinvara 9 or even more modern eye-candy Saucony Freedom ISO 2, both on top of what could be tagged as "natural running". Retail price will play a significant role to boost sales against competitors. Although Fresh Foam Boracay v3 could be considered as theorical predecessor of the current FF Beacon, there are too many changes, including superb 20% weight cut. Clean upper is based on knit-like mesh which adapts great but raise some concerns about breathability, particularly during intensive long runs and/or under high temperature. Lack of external overlays gives more relevance to classical "N" from New Balance on both sides made of reflective material to increase visibility under poor light conditions. As expected in FF Beacon, impressive midsole is enterely made of latest Fresh Foam development which plays with internal geometry featuring great blend of cushioning and response although not as responsive as fantastic Fresh Foam Zante v4. Outsole offers full length ground contact and has been reinforced with harder rubber only in more exposed areas, something that raises several questions about durability under regular conditions. As usual, it is mandatory to wait for feedback from unbiased runners to check real life performance.